This is being called a championships on the flier, but as many of you know I can’t support just any ol’ tournament calling it’s self a championships. Maybe if it means what it says and is supposed to be a championship of Oregon. Either way, it’s just a tournament. And I bet it’ll be awesome. The “big” tournaments are good if there is one or two a year, it’s the smaller tournaments that I’m liking more. Not as much pressure, more of a relaxed feel. Anyway hope this one goes well, I’d be there if it was not so far from where I live. 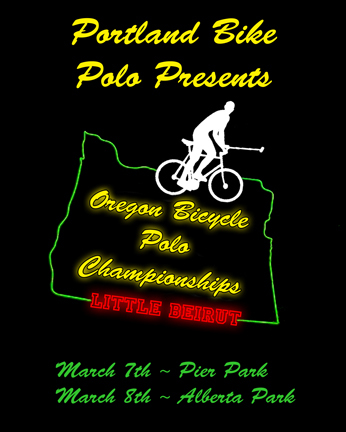 This entry was posted by Doug D on February 8, 2009 at 12:01 am, and is filled under Bike Polo, Events-Past, Oregon. Follow any responses to this post through RSS 2.0. You can leave a response or trackback from your own site. Now Doug, this is a big deal championship tournament in west coast circles, I will put East Van, Seattle, and Portland against any three polo cities on earth, these guys are good down there. Should be a twenty team tourney I should think, it serves as the rust remover for the West Side and the North Americans for us, the season opener. Thats what im talking about pieter season opener we have alot of heavy west coast tourneys this season.